Nowadays, there are many options when it comes to teeth straightening. Some options are more discreet than others, while some are more effective at resolving certain issues. 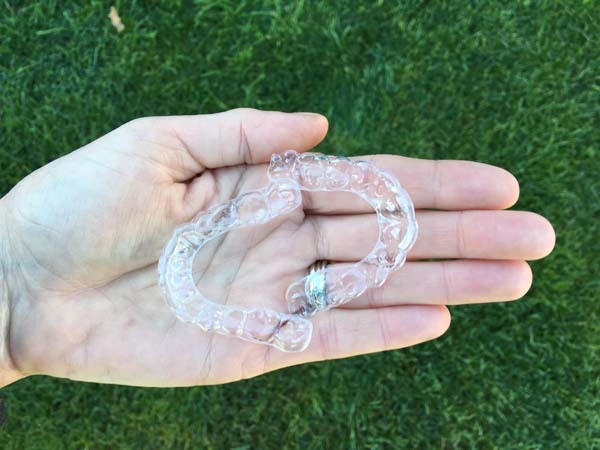 Deciding between clear aligners or braces is a discussion that involves the dentist and patient. Let us take a closer look at both devices in more detail. Traditional braces have been the most commonly used device for teeth straightening in the past century. These devices consist of metal brackets placed on each tooth and metal wires on each half of the patient's jaw that connect all the brackets. When the wires are tightened, the device exerts pressure on the patient's teeth. This gradually moves them into the desired position over a period of time. Braces are typically worn for around one to four years. Over the years, there have been many modifications made to traditional braces. Other types of braces have been developed, like lingual and ceramic braces. Both work using the same principle, but they offer better aesthetics. Clear braces are the more discreet option when it comes to dealing with poorly-aligned teeth. This prosthetic are made from transparent plastics, making it almost impossible to know when a person is wearing one. Clear braces work using the same principle as traditional braces. The tray exerts pressure on the wearer's teeth, gradually moving them into the desired position. Patients get a series of mouth trays and each is used for a period of about two weeks. Each successive tray pushes the patient's teeth closer to the desired position. Unlike traditional braces that can only be removed by a dentist, clear braces can be easily removed by the patient. That means the person is free to enjoy the food they like without having to worry about damaging the mouth tray. When they are done, they simply put it back in. Thinking about getting your teeth straightened? Talk to one of our dentists about your best options today. « What Are Same Day Crowns?